Tokyo (VNA) – A workshop focusing on the 50-year history of the Association of Southeast Asian Nations (ASEAN) was held in Tokyo, Japan on August 8 on the occasion of the bloc’s jubilee anniversary. The event, jointly organised by the ASEAN Japan Centre (AJC) and the Economic Research Institute for ASEAN (ERIC), was attended by ambassadors and embassy representatives of the ten ASEAN nations and its dialogue partners, and 300 delegates of the government, academic and business circles in Japan. 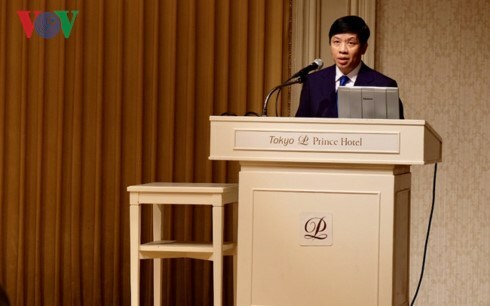 Opening the workshop, Vietnamese Ambassador to Japan Nguyen Quoc Cuong, who is also Chairman of the ASEAN Committee in Tokyo, described the event as one of the significant activities to mark the ASEAN’s 50th anniversary. From the first five founding members, the bloc has continuously, overcome difficulties and challenges, maintained its solidarity in diversity, and grown into the ASEAN Community with 10 member nations, with open external relations. The ambassador noted that while ASEAN Community has become a model for successful regional cooperation, it is also facing challenges in the context of fast changes in the region and the world, along with the ongoing fourth Industrial Revolution 4.0. He affirmed that Japan is one of the leading and closest partners of ASEAN.